Students of Sri Chinmoy from all over the world celebrate Sri Chinmoy’s Birthday Anniversary – either in Jamaica, Queens (NY) or at home at their respective Meditation Centers. As a special feature Guinness Record holder Ashrita Furman plans to brake the record of a cake with the most candles; in fact he plans to enkindle 72’000 candles. More information to come by tomorrow. This new episode of the series LIFE Voices (#39) brings you an interview with ultra-runner Vajin Armstrong from New Zealand, who was recently first in the Swiss Alpine Marathon in Davos, Switzerland during July 2016. The interview was conducted in Zurich shortly after his period of running through the Swiss alps. Vajin, a disciple of Sri Chinmoy for 18 years, reveals how he combines sports and spirituality, and gives advice for new runners. One of his favorite races is the 47-hour race conducted every year on Sri Chinmoy’s birthday on August 27 in Queens, New York. The video is produced by Kedar Misani; the soundtrack is by Parichayaka Hammerl. On Friday August 12 and Saturday August 13, 2016, a 27-Hour Cycling Relay took place. Some of the participants were cycling alone, others were cycling together – the largest group events took place in Vinnitsa, Ukraine, in Vienna, Austria and in Schlieren, Switzerland. Fifty participants altogether crossed total of 2484 kilometers. Click here to see the list of all participants and their distances. What makes a perfect divine enterprise? 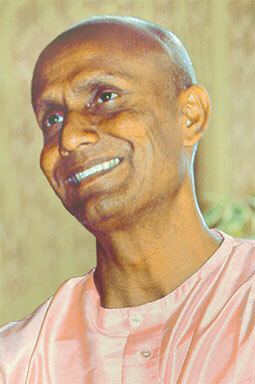 SRI CHINMOY: The perfect divine enterprise is the joint contribution of perfect workers. A divine enterprise embodies the golden opportunity to serve the Supreme in a very significant and tangible manner. The owners of the divine enterprise must always remember that their divine enterprises are supreme Gifts of the Supreme, to be utilised by the Supreme Himself. The owners and the managers must develop, if they have not developed already, a magnanimous heart—an ocean-vast heart. They have to sympathise with the workers and they have to feel the needs of the workers at every moment. They must feel that they and their workers are part and parcel of the same family. Divine enterprise owners must not think of being multimillionaires in the outer life. They can become millionaires in the inner life just like those who work there. Your inspiration is infinitely more important than dollars in the bank. You come into the world with a special mission and vision. Wherever you are, you have the mission to do something special for the Supreme. Your mission comes from vision, and your vision comes from a higher source, which is your Guru. Oneness, oneness, oneness! The perfect enterprise is perfect oneness in the inner world and perfect oneness in the outer world. People who work in a divine enterprise should feel that they are extremely fortunate. When you want to do something, the opportunity is given; whereas when you work in other places, the opportunity may not be given. Perhaps the person beside you is unaspiring, and you will have to listen to his undivine conversation. The money-power that is needed, God will give. Heart-power, also, God will give. But if you pray for more money-power than you actually need, it makes Him sad. God knows that it will destroy your consciousness. You can pray for heart-power as much as you want and He will give it; but if you pray for money-power, it makes Him sad. What can we do to create harmony? SRI CHINMOY: When we do not have harmony, we remain in the abysmal abyss. It is all darkness: screaming, fighting, wrestling, strangling, boxing, kicking! Lack of harmony comes when I feel that I know how to do something better than you. Lack of harmony is the song and dance of superiority. Because everybody feels superior, disharmony at every moment is entering into our lives. But what is this feeling of superiority if not a feeling of inferiority expressed in a clever way. Even if we know perfectly well that so-and-so is absolutely wrong, we have to be wise and remain silent. Eventually, the other person will see the light. But if we are all the time fighting and quarrelling, we will only destroy our subtle nerves, which are needed to expedite our spiritual journey. So, if we use our wisdom, automatically self-effacement (in Deutsch: Zurückhaltung) comes. Self-effacement is the easiest and the most effective way to establish harmony. One thing we can do is practice japa, repeating, “Self-effacement, self-effacement, self-effacement.” If we do this japa, we walk on a road that is sunlit and we reach our destination. How can I not criticise others and what can I do when others criticise me? SRI CHINMOY: When somebody criticises you, think of that person as an insect or worm and feel that you are the strongest and largest elephant. Since you are larger than the largest, you do not have to pay any attention to a little insect or worm. So, when others criticise you, you have to convince yourself that you are infinitely stronger than the criticism that you are getting. When you are inspired to criticise someone, immediately feel that what is disturbing you in the other person is some weakness that he/she has. Feel that the wrong thing that he or she is doing arises out of some deplorable weakness. Then, try to feel that your criticism of the other person is only increasing his or her weakness and making it worse. Also, you have to feel that your criticism is causing all kinds of ailments inside the other person. Then try to pull these ailments into your own system – into your hands and legs or head. Immediately you will say, “My God, it is so painful, so painful!” Then you will see how much suffering you are causing that person. Or imagine that your words of criticism are like an arrow that you have hurled at the other person, and now his/her entire being is bleeding. When you see him/her bleeding, your sympathetic oneness will make you feel miserable. It is the same kind of sympathetic oneness that Lord Buddha felt when he picked up the bird that had been wounded with an arrow. When you identify yourself with the other person’s suffering. you will feel, “No matter how imperfect and useless he/she is, I have no right to cause this kind of suffering in him/her. I have come into the world to establish my oneness with others and not to destroy others with my criticism.” Then your heart of oneness will make you stop criticising the other person. These ideas I am giving you are very practical. Here is still another way. Each time you criticise someone, feel that you have created a black spot on the moon of his/her heart. By diminishing the beauty of his/her heart’s inner moon, you can never get real joy. Also, you have to feel that if your criticise him/her, he/she also will criticise you and ruin the beauty of your inner moon. By destroying one another’s inner beauty, neither one of you can be happy. So, you have to feel that your happiness can come only with the other person’s happiness; it has to be simultaneous. If you do not darken his/her moon, he/she will not darken yours, and both of you will be happy. How can we work more harmoniously in enterprises? SRI CHINMOY: To keep harmony when you are dealing with other individuals, do not use your justice-light. Forget about justice! There is no justice on earth. Only think of wisdom-light. Always be as humble as possible. Even if you feel that others are idiots, use absolute humility – if necessary, forced humility. Force yourself to be at the other person’s feet, not on the other person’s head. Let them increase their stupidity. Let their ego-ballon become large, larger and largest. One day it will burst. True, by becoming humble, you are pumping them up. But at least you are not increasing the disharmony. It is not something you have to do all your life. For one or two months or a few years you will do it. Then you will see that eventually the other person’s ego-balloon will burst and he will be on the same level as you are. Otherwise, without humility, there is no way to have harmony. This year’s winner of the longest race in the world, the Sri Chinmoy Self-Transcendence 3100 Mile Race in Queens, NY, is Yuri Trostenyuk (52) from the Ukraine. Yuri has finished the 3100 three times, with a second place finish in 2014. He is a four-time winner of the 10 Day Race, and has finished 12 multidays in 13 years of running. He works as a plumber in Vinnitsa. Get more news, photos and videos on Utpal’s blog.